Vulcanic cabinets and control units are intended for the power supply and temperature control of heating and cooling solutions (immersion heaters, heaters, duct heaters, cartridge heaters, chillers, etc.). 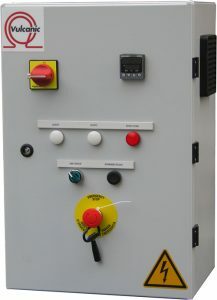 Power supply 200 W at 3 MW, 750 V 3-phase. Cabinets and control units comprise a plastic or metal (steel or stainless steel) IP53 to IP55 cover. On the front, they have safety components (isolating switch, emergency stop), information components (settings, temperature, heating status and fault lights) and on/off switch. Two settings modes are available: By an on/off regulator using mechanical contacts, by a PID (proportional-integral-derivative) regulator or by a programmable controller (SGC) for the management of multiple areas, using static power units (PU). Information from the measurement sensor, Pt100 or thermocouple, can be directly connected to the regulator or controller, or by a logic signal (0/10V), analogue signal (4-20mA, 0/10V, etc.) or digital signal (Modbus, Profibus, Ethernet, etc.). 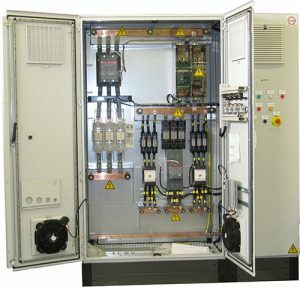 Cabinets and control units are equipped as standard with an external safety loop by dry contact enabling client safety devices (thermostat, flowmeter, presence detector, etc.) to be integrated. Optionally, it is possible to provide additional inputs and outputs such as on/off and remote setting, fault and measurement reporting as well as power supply to a fan unit or pump. Regulators and static power units are available from stock and may be supplied separately. 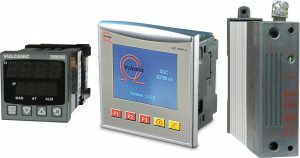 Vulcanic power supply units and control units are designed and manufactured either as part of our standard range or as a customised solution in our factory in Neuilly sur Marne and comply to the EN 60204 standard.